Are you tiered of dealing with acne that just won't go away? Have you tried everything to get rid of acne breakouts? Are you desperate for something that will actually work for YOU? Imagine what it’s like to wake up with confidence again. Not only clear skin, but beautiful glowing and youthful looking skin. Tired of dermatologists who keep prescribing antibiotics (oral or creams) that simply don't work? Attempted Proactiv type products and are still breaking out? Do you feel desperate for clear skin? We provide the most cutting-edge acne treatments available in the San Francisco Bay Area for problematic and acne-prone skin. We are standing by, with our Certified Acne Specialists and California State Board Certified Esthetician, ready to clear your skin in way that you have never experienced before, from ALL stages and types of acne. We will educate you on what acne is, what your personal acne triggers are, and the next steps are to achieve a healthy, acne-free life. On average, only 3- 6 treatments, a skin care regimen, and our expert guidance will do the trick! We can clear your skin safely in about 6 weeks to 3 months, depending on the stage and type of acne. Unsure? That's perfectly okay, our new clients were once skeptical too. If you scroll down, you'll find many before and after photos and countless testimonial reviews – check these out, then decide. Whenever you're ready to check out this cutting-edge acne treatment that's sweeping the nation, we'll be ready for you. What do you have to lose, except blemishes, self-doubt, and pesky acne? Call us today to ask any questions or make an appointment. A detailed education about acne. Know why acne may be successfully thriving in your skin and how to prevent it. A deep understanding of the type of acne you have and your personal acne triggers. You will be thrilled to experience your skin continually transforming from congested acne-prone skin to a clear, flawless and radiant complexion. More self confidence about your complexion. Education to have an entire lifetime of acne-free, clear skin. Daily tools for acne-free skin maintenance. Real solutions to flare-ups and breakouts. Personal and supportive guidance from the experts through the whole process. A personal skincare plan highly customized to encourage long-term, healthy skin. Best of all, you will gain a radiant, clear, acne-free complexion! The causes of acne and prevention techniques. Did you know there are different types of acne? We will identify which kind you currently have. Your current skin care regimen. Dietary choices and lifestyle habits. 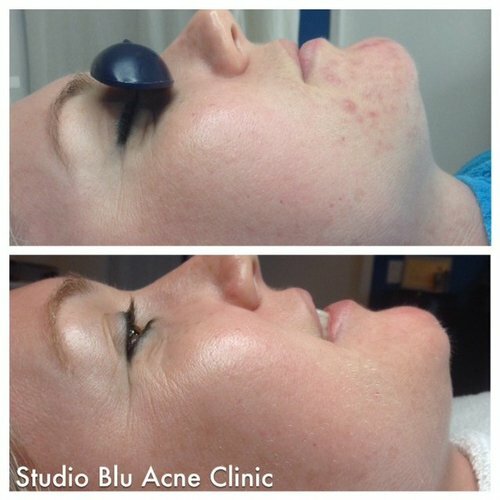 Studio Blu Acne Clinic believes in looking at all the factors in treating acne - a holistic approach. Since diet, skin products, lifestyle habits, and environment can all be factors, we believe that effective skin care necessitates creating a plan addressing all these factors. Initial skin care kits are required to receive treatment and are approximately $180 to $200. Additionally, we sincerely respect the trust you place in us as your personal skincare partner and believe in a straightforward and honest approach to your treatment. Informing our clients on every aspect of the process and the products is crucial, and we place a high value on client education as you proceed through your personal acne treatments. MORE QUESTIONS? Check out our frequently asked questions page by clicking here. Or our booking page by clicking here.